I’ve prepared this list of testimonials and reviews and will be replacing it with fresh ones periodically. We’ve had many compliments on the ceremony, we couldn’t have done it with out you! Everything went so smoothly! We had an amazing time and received many compliments ranging from the ceremony and wine box, to the band and cake. We appreciate all the time you took to work with us on making everything perfect. We were very pleased with our wedding day. Everything went smoothly and people seemed to have a relaxed, good time. … Thank you for your help in all the planning! We really had no feel for the logistics of a wedding, and you made everything very easy. …you were so kind to take the time to get to know us out-of-towners, and we will always be grateful for the special role you played in our union. …everyone came up to me afterwards and told me what a beautiful ceremony you performed. And I really appreciate all your help and guidance you provided us throughout the entire process. You were so helpful and always put my mind at ease. 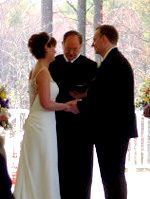 The ceremony was abosolutely LOVELY and we couldn’t have been more pleased. We both (and everyone) are still talking about the ceremony, the reception, and the brunch on Sunday. We had a lovely time and eveything was absolutely perfect. We are soo very glad we chose you to be our minister, and we sincerely thank you very, very much.